It’s a drizzly Friday, and water pools on the pavement outside the tiny houses of Dignity Village. 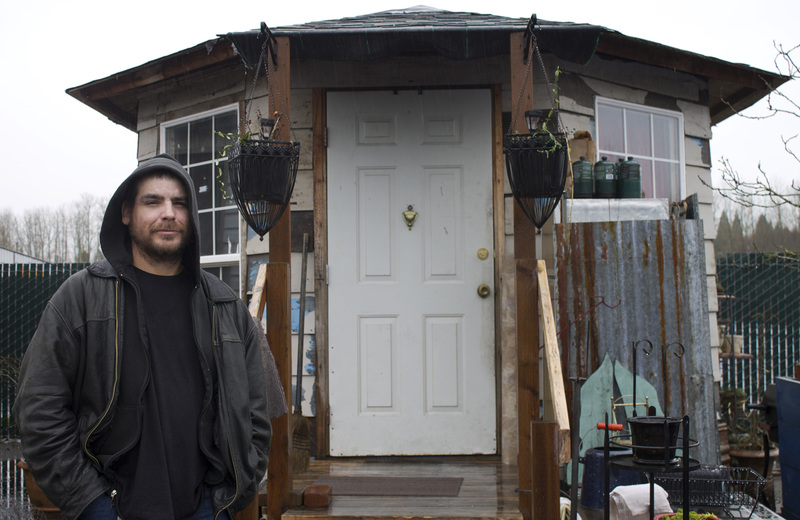 Located in North East Portland, not far from the airport, the 43 tiny homes are built on raised decks, and stand arranged in cull de sacs and miniature streets. Just past the front gate, the main street is lined by equally tiny community buildings, like the administrative office, which has a large yellow-painted cow in front of it. Further down the main street is the commons, the largest building on the property, and across from that the shower building, painted blue with yellow trim, and a cartoon of a man bathing. Many of the houses have murals painted on them, and each house is unique. That was in 2007. Before that, in 2000, it was Camp Dignity, a group of homeless people who banded together, partly in protest, partly just to have a safe place to sleep. 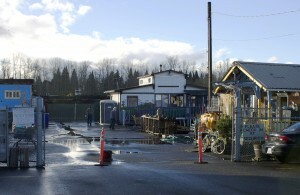 The group started out in downtown Portland, moving six times before ending up near the site where the village is now in 2001. 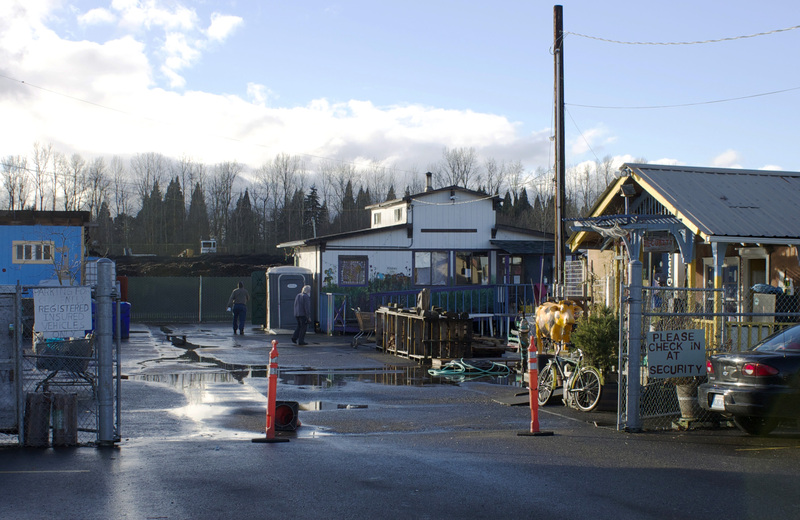 It wasn’t until 2004 that the city designated the site a temporary campground, and it was another three years before the village moved to its current site, and the city signed a contract officially allowing Dignity Village, by then incorporated as a non-profit, to manage it. 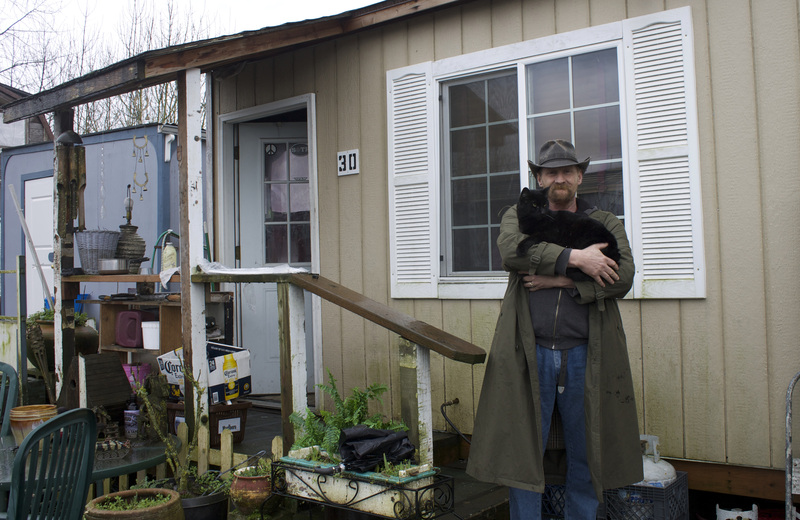 Now nearly eight years old, Dignity Village has proven to be the first of many tiny house villages for the homeless. 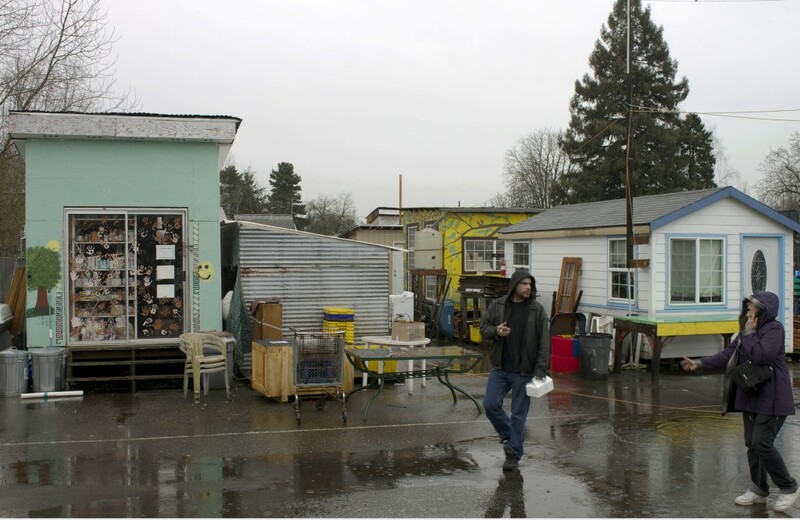 Other villages already in operation include Opportunity Village in Eugene, Oreg., Quixote Village in Olympia, Wash., and Occupy Madison Village in Madison, Wisc. The appeal of the tiny house village is that it offers residents autonomy, and a home they can call their own. Unlike a shelter, it doesn’t have to be vacated in the morning. The village collects monthly dues of $35 from its members to cover the cost of insurance, water, waste disposal, port-a-potties, telephone, and electricity. The priorities are water, waste disposal, and portable toilets, since the village would be shut down if it lost any of those services. “I don’t mean to but in,” says Bobby, “but I would like to point out that we have had some recent success in selling some things.” The village houses items that it now tries to sell on Craigslist in the once-aptly-named Ebay building. They also used to hold garage sales but the person running them left. “Our biggest sales here in the village has been fire wood,” says Rick. Bobby, 41, moved to the village six months ago. Like everyone else in the community, he came because he had no other place to go. Bobby came to Portland from North Dakota after he was diagnosed with leukemia on July 27 2012. He left his job and family behind so he could get on a list for a bone marrow transplant at the Oregon Health and Science University. When he first arrived, Bobby slept in his car on a road 68 miles from Portland, with a friend he picked up in Twin Falls, Idaho. At one point he did try his luck at some of Portland’s missions downtown, but felt he got less than a warm welcome. “They treat everybody like they’re criminals,” he says. “It doesn’t matter who you are, or what your background is, or where you came from. The added stress of that, to what I already have to deal with, I just couldn’t go and do that.” Luckily someone told him about Dignity Village, and he and his friend found a home in the tiny community. The coupled live in a hexagonal tiny house built by a former resident who’s since passed away, and they have done some work to improve it since moving in. “It is what you make of it,” says Bobby, when asked about his house. “We fixed it up and now it’s kind of like a mansion.” The home shows what can be done in a tiny space. Though it is a little cluttered, there are homey touches like a small plastic chandelier hanging from the centre of the roof, and pictures on the walls. A partition separating the kitchen cupboards from the bed allows for a small closet on the bedroom side, and there’s a green camping stove set across from the kitchen table. The couple watches DVDs on a portable player at the end of the bed, and pieces of Kimberlee’s skull-themed collection can be found throughout the space. 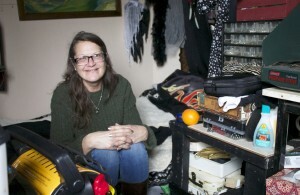 The freedom to customize and “do-it-yourself” reinforces the fact that residents of Dignity Village have some ownership over their homes, unlike, for example, residents of Vancouver’s single room occupancy hotels, who protested unhygienic living conditions in October. And the sense of agency villagers are offered isn’t just over their own homes. They also help run the daily operations of the village. Bobby goes next door to the security shack where he’s expected for a two-hour shift. With walls made of hay bales and cob—a mixture of sand, clay, water, and straw—the shack has a kind of western look to it. Inside, two black cats, Tubbers and Shadow, drink and sleep (respectively) in the windowsill. Bobby points out a map of the village drawn on a whiteboard hanging above the desk, and then takes a seat. The shack is manned twenty-four hours a day, and villagers take turns checking residents in and out so that there’s an accurate headcount in case of emergency, and checking in any visitors who’ve come to use the village’s facilities during the day. Security volunteers also pass on messages, and answer the phone. 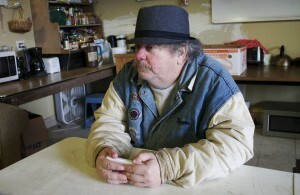 “When we take phone calls, we don’t say Dignity Village,” Bobby says. “Because … if an employer calls to talk to a specific person, then you don’t want to tell them it’s a homeless camp.” They also manage the charging station, which villagers can use to charge their cell phones. For “luxury items,” such as laptops and car batteries to power house lights, they must pay $1 a day. 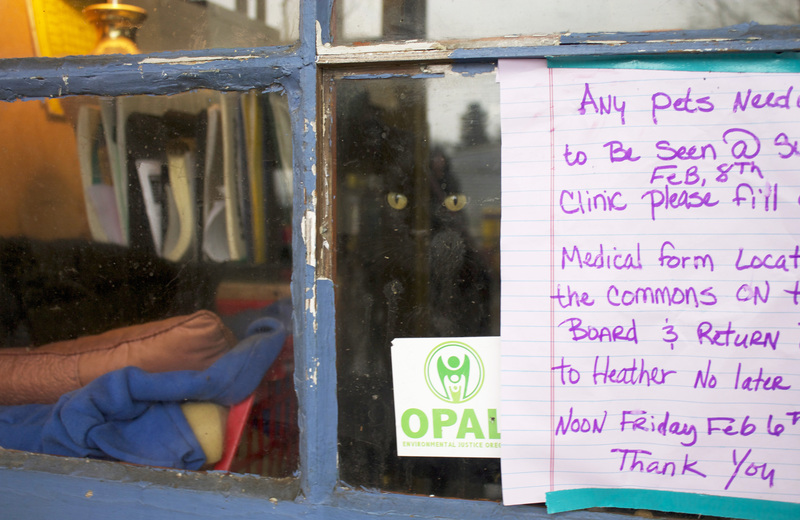 The security shack is also a kind of information booth, with a schedule for the number 70 bus, which stops right outside the village, posted on the door, and a notice in the window inviting villagers to sign their pets up for a vet visit. Community is yet another benefit of the tiny house village, where the shared amenities, and abundance of outside space encourage villagers to mingle. Over in the commons a few villagers are waiting out the rain and watching episodes of Ghost Whisperer, including Ray, 54, who moved into the village over a year ago. For the most part he likes it there, but his house is the only other structure on the property made of cob. He says it can get cold, even with his heater. Besides the TV, there are various couches and chairs scattered about—the exact number varies, but today there are four couches and six chairs—and a communal kitchen area. It’s where the village meetings are held, and a place for overnight guests to crash. In the early afternoon the rain finally stops, and villagers gradually make their way out of their homes, gathering round outside the commons to chat. Among them is Margaret, 51, and one of the board members. She’s been in the village since July, and before then was living in her truck. 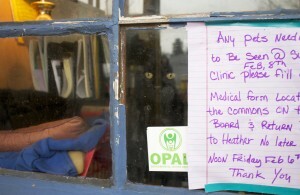 Margaret worked as an accountant for a non-profit, but lost her job due to cut backs. 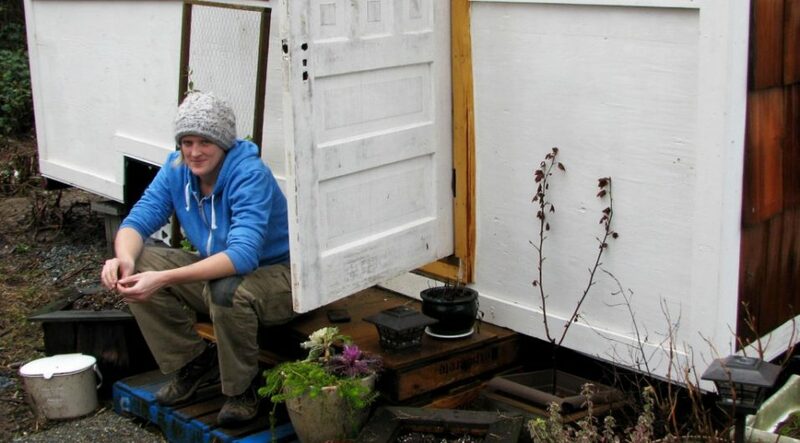 Ironically, part of the reason Margaret is at Dignity Village is because tiny houses aren’t legal residences outside the village, including on the rural property in Mount Hood where her husband is building them a permanent little house. While finishing construction on the house, the couple took up residence in an R.V. on the property, but a neighbor noticed and reported them to the county. 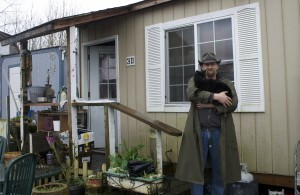 The R.V.’s now gone, but Margaret’s husband is still living in the tiny house, finishing the build. Still jobless and looking for work, she’s had to leave so that the county won’t come by during the day and discover her living in the illegal abode. Margaret isn’t sure when she’ll be leaving the village, but Bobby and Kimberlee are planning their departure.